The Most Elegant Way to Write on Windows! 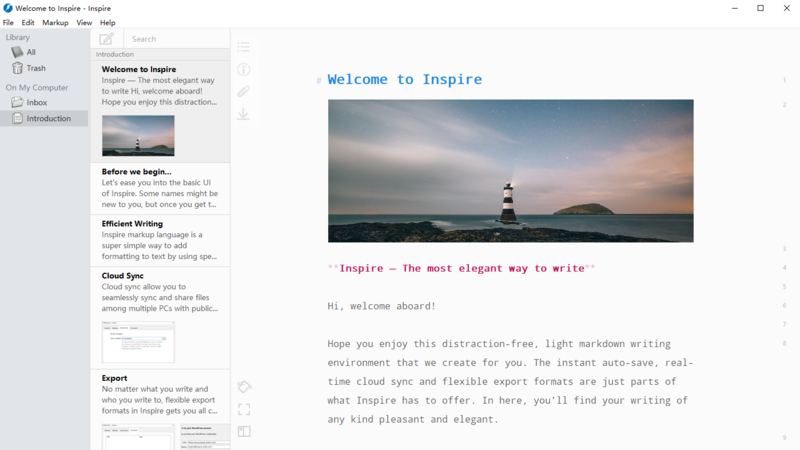 Inspire creates a distraction-free, light markdown writing environment that boasts your productivity. From quick notes to blog posts to great novels, you focus on the content, and Inspire helps with the rest. Instant auto-save, real-time cloud sync and flexible export formats make your writing of any kind pleasant and elegant. – Inspire is designed for maximum productivity. The distraction-free, light, clean interface allows you to focus on your writing. – The markup shortcuts with syntax highlighting give you an immersive experience without giving away readability. – Mark-up based editor and full keyboard support allow you to say goodbye to the mouse. – Auto-save and automatic backup so you won’t need to worry about losing any of your work. – Packed with typography, the flexible multi-format export feature makes your writings look great everywhere. – Sync groups and sheets among multiple PCs via cloud syncing services such as Dropbox and Google Drive seamlessly.